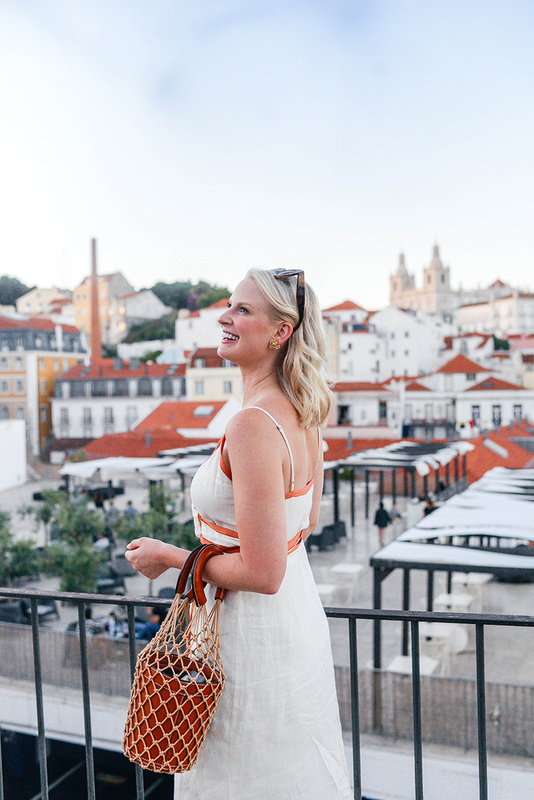 I’m super sad to announce this is my last outfit post from my Portugal trip last month! We had such an amazing time and I will definitely be planning a trip back someday. Now that I’m home and getting settled for a few weeks, I’m going to start working on The Portugal Itinerary for A Detailed Destination! In case you hadn’t heard, The Paris Itinerary went live over the weekend! If you’ve got a trip to Paris planned for this summer or fall, definitely check it out. As I mentioned in this post, there were lots of amazing viewpoints all over Lisbon… but this one was definitely my favorite! 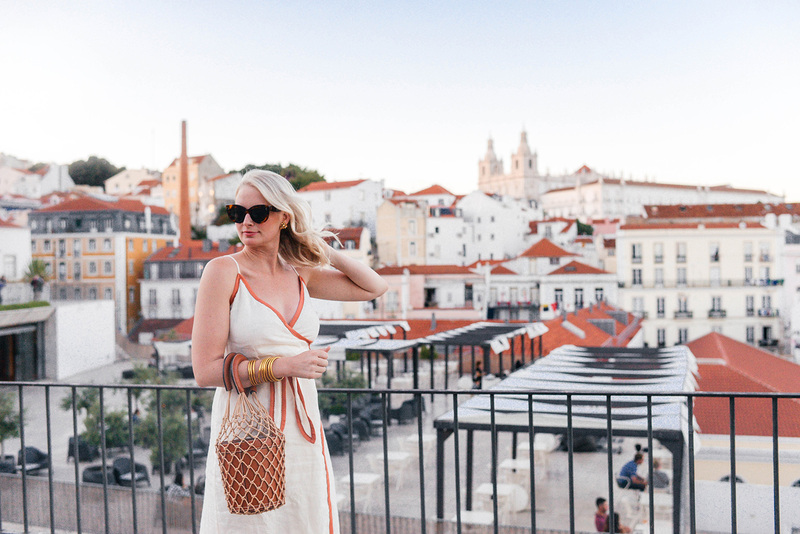 I bought this dress specifically for this trip knowing it would look fabulous against a backdrop of terracotta rooftops and a pretty Portuguese sunset! It’s a little more low cut than I would normally wear, but heck, I was on vacation and YOLO. Because I know some of you will ask I wore these with the dress – it’s too low to wear a normal bra, but these pasties worked wonders! Not exactly supportive, but they definitely cover up the important stuff. 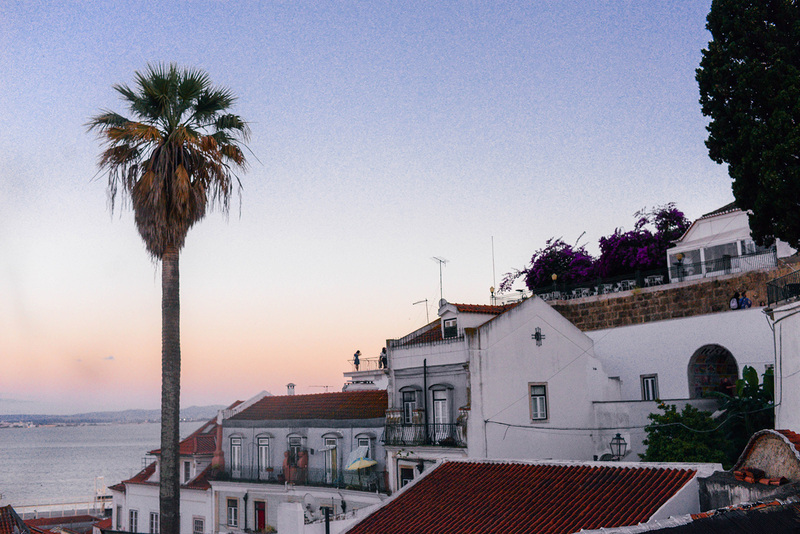 Since I already told you about this particular viewpoint and this is my last blog post from Lisbon, I did want to tell you a little about where we stayed! For our four nights in Lisbon, we decided to stay at the Heritage Avenida Liberdade Hotel. If you’ve never been to Lisbon, Avenida Liberdade is a grand promenade featuring beautiful designer stores that leads all the way up to Rossio Square. It’s the perfect location – it’s part of a very busy area, but is also completely quiet at night! Our room was sizeable (as was the bathroom! ), and the hotel features an indoor pool + fitness area that I enjoyed every morning of our stay. One of the many fun perks of this hotel (and definitely our favorite perk) was free Port every night in the lobby! If you’re planning a trip to Lisbon, I definitely recommend checking out the Heritage Avenida Liberdade. Very comfortable and great service! PS: this bag that has been sold out for MONTHS is finally back in stock here!! It’s already low in stock, so don’t wait to buy it. It’s one of my favorite purchases for spring/summer that I can’t wait to wear into fall too. That dress looks gorgeous on you! Thanks for sharing that the bag was back in stock on your stories as I snagged one up right away! That dress is stunning!! 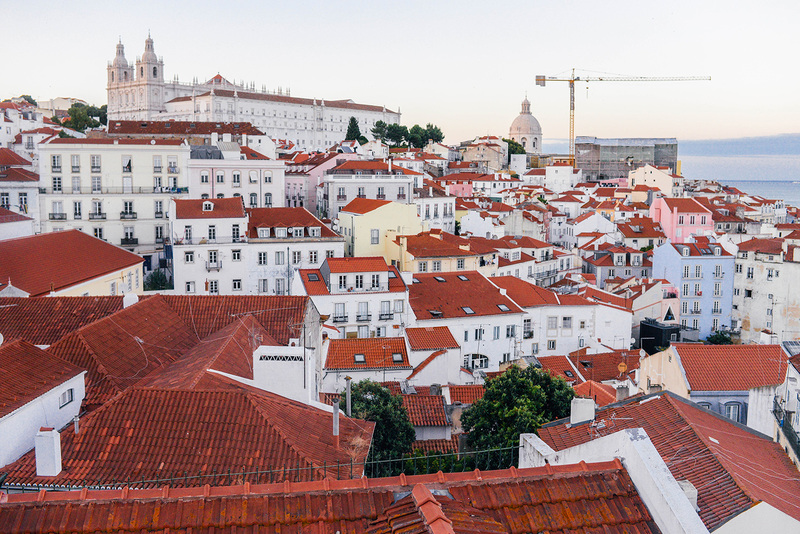 And that spot is my favorite viewpoint at Lisbon too! These pics are beautiful and I love your dress! LOVE how these photos turned out! I’ve been following you on Instagram and just now have started reading your blog. I have to say you are one of my favorite bloggers out there. I love your style of writing, you don’t come across in an offensive manner as some of the other bloggers do. I won’t mention any names, but some of them are just so full of themselves. Plus, several of them do not disclose when whatever they are shilling was a freebie. Seems dishonest, IMO. Anyway, keep up the great work, I look forward to seeing future posts of yours! You seem like a genuinely nice person. Thank you so much for reaching out, and thank you for your kind words about my blog! I’m so glad you’ve enjoyed following me on Instagram and now are reading on here. Have a great day!